Do you need extra help for EL students? Try the Comparing Character Traits pre-lesson. 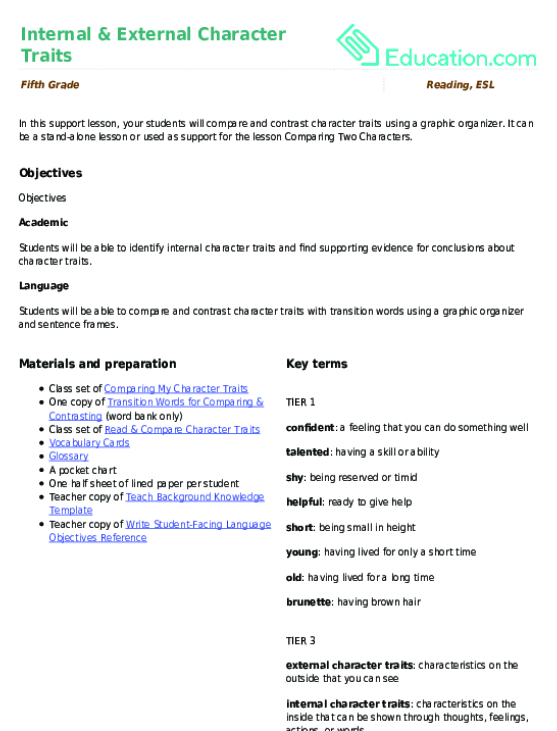 Students will be able to compare and contrast characters based on their character traits. Prior to the start of the lesson, start acting differently than how you normally act. For example, start acting very depressed or very rigid to your students. They will most likely ask what is wrong. Brush them off so that they will compare your current actions to your normal behavior. Still in character, write compare and contrast on the board. Have students think about their meanings and discuss them with their table groups or partners. Explain that compare means to find similarities, while contrast means to find differences. Provide visuals or real-life objects to demonstrate the meaning of compare and contrast. Bring out the Venn diagram and label the right side "Normal" and the left side "Today." Ask students to think about how you normally act vs. how you acted today. Have students discuss similarities between the two behaviors with their table groups or partners. Lead the whole group in a discussion, adding their thoughts to the diagram in the middle area where the two circles overlap. Encourage students to look at your words, actions, decisions, physical attributes, and interactions with others. Have students discuss differences between the two behaviors with their table groups or partners. Lead the whole group in a discussion, adding their thoughts to the separate sections of the Venn diagram. Encourage students to look at your words, actions, decisions, physical attributes, and interactions with others. Reiterate the learning objectives and tell students they will be doing this same activity with a read-aloud. Demonstrate how to use a Venn diagram with a culturally relevant topic that they can discuss in their home language (L1) or new language (L2). Define all the character attributes. Allow ELs to repeat the student objective and note any unfamiliar words. Hand out the Venn diagram sheets and ask students to write: thoughts, words, actions, decisions, physical attributes, and interactions with others on their papers to remind them of what they are looking for when they compare and contrast as you read. Start your read aloud by showing the pictures and getting students thinking about the topic. Read the first page carefully, showing the pictures. This is one of the few times the old man is talked about or shown. Ask students to make notes on those six things they noted on their paper. When the students are done taking notes and looking at each picture, continue the read-aloud. Allow them to take notes on the boy as you read. Remind them that the area in the middle of the Venn diagram is where they put their comparisons of the two characters. Read the last page and show the picture, allowing the students to add to their notes on the old man. Have students compare their findings with one another. Lead the group in a discussion of what comparisons and contrasts they found. Give an explanation of how they can use the same strategies to compare and contrast settings or events in a story. Allow students to sort prewritten sentences into the correct location on the Venn diagram. Ask them to read each sentence aloud before choosing the correct placement. Give opportunities for ELs to discuss the text and the two characters before or after they take notes about the pictures. Provide pre-identified words to help them create their sentences or phrases for the Venn diagram. Give students sentence starters for their discussions in partners about the character comparisons. Explain to the students that they will use the same strategies to compare and contrast the setting. Have students complete the Room 8 worksheet. When students are done, have them read their independent reading books. Have students draw a Venn diagram in their reading journals and start taking notes on the characters in their books. 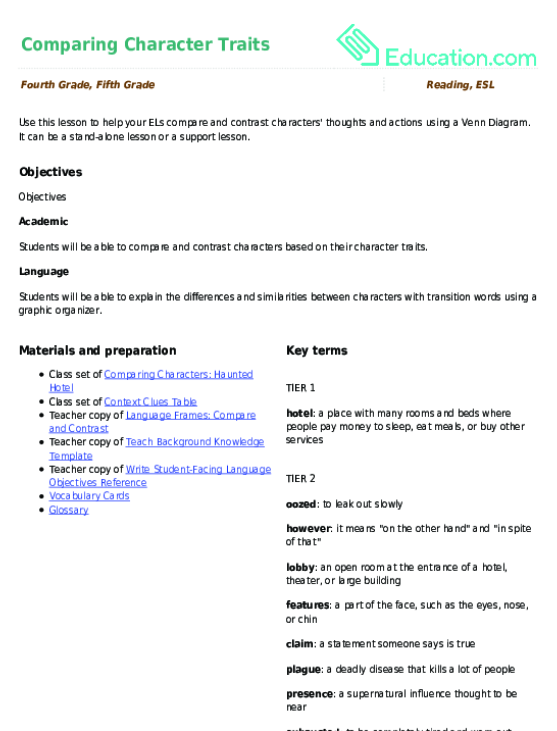 Provide a shortened or simplified version of the text and a glossary with bolded key terms. Allow ELs to read in pairs before completing the Venn diagram at the bottom of the page on their own. Ask ELs to focus on one to three of the character attributes rather than all six. The Venn diagram is a great visual model for students who need support. Give these students the opportunity to sketch images to represent their comparisons. Have advanced students label the six aspects of character analysis (thoughts, words, actions, decisions, physical attributes, and interactions with others) on the Venn diagrams in bullet points. Have them find a note for each point and label it on their diagrams. Examine the students' worksheets and use them as a formative assessment of their ability to compare characters from a text. Distribute an index card. Ask students to write two to three sentences comparing the two characters in the Room 8 worksheet. Ask them to choose a character attribute of their choice to highlight in their sentences. Ask ELs to orally provide the character comparisons and then write them down using sentence frames. The two characters were different because____. 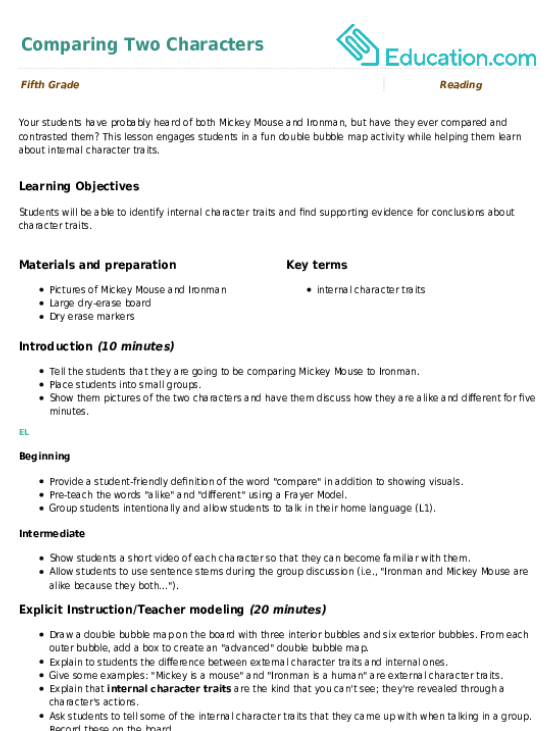 The two characters were similar because they both____. While ____ did/said____, ____did/said ____. Allow volunteers to share their successes or learning experiences with the rest of the class. Allow them to share in their L1 or L2 in partners. Allow ELs to reread the student objective and share their thoughts with a partner about their goal attainment. 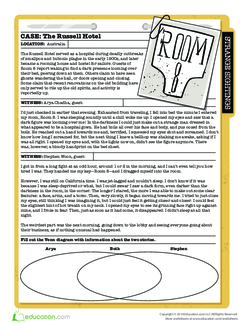 Use this worksheet to show how to compare characters’ thoughts and actions. Main characters would be lost without their supporting characters! 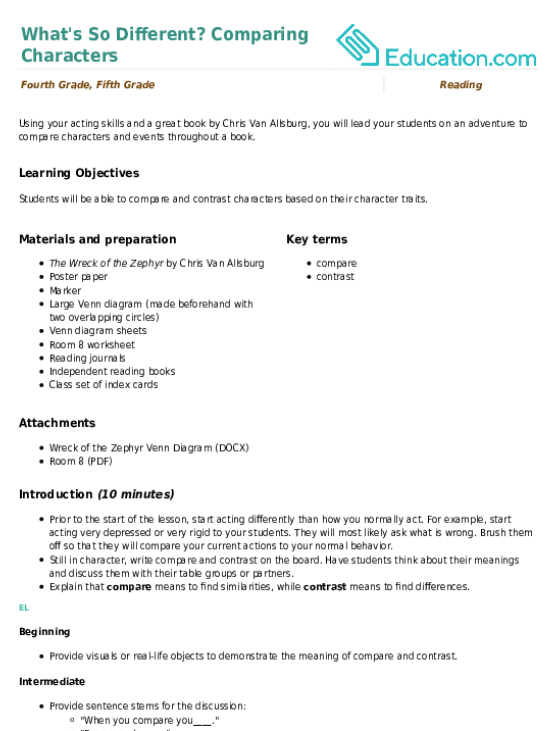 They will also meet two unique characters that they will compare and contrast by referencing specific examples from the texts. Students will read passages and compare the traits of two characters. 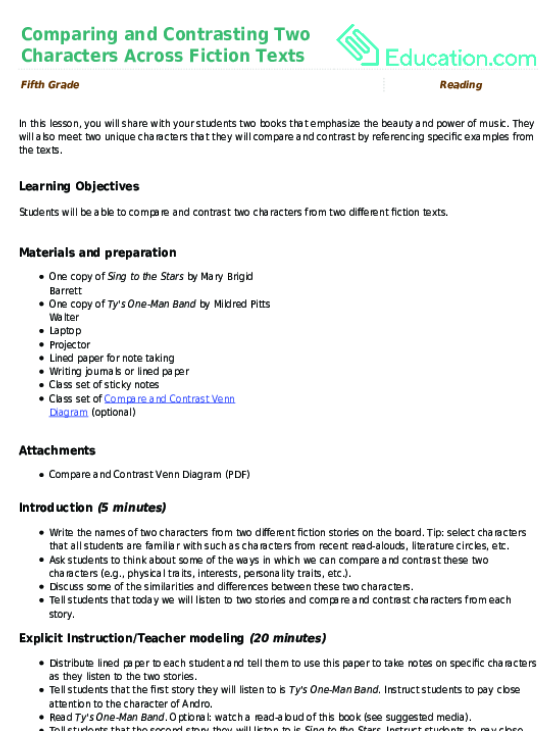 This helpful resource gives your students practice comparing story elements. It can be a stand-alone lesson or used as support for the lesson Comparing Two Characters. Comparing different stories is a great way to help your young reader get started with analyzing texts. She'll compare and contrast two children's favorites.